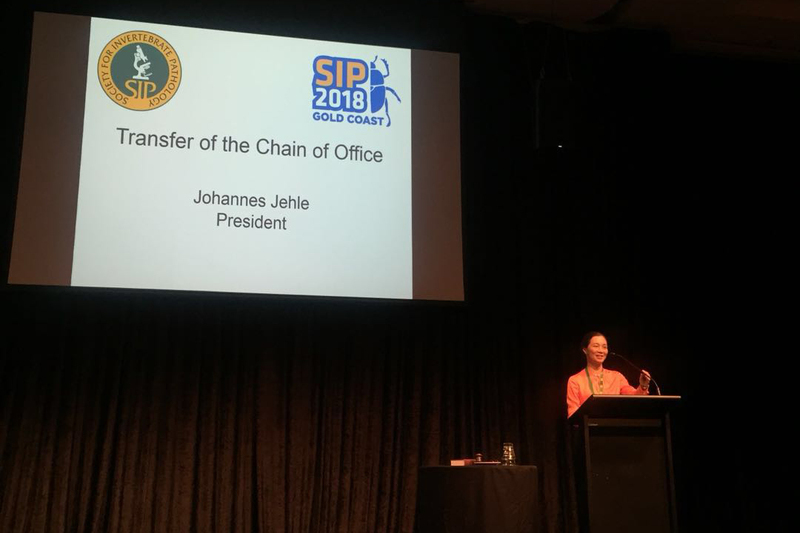 Recently, the 51st Annual Meeting of the Society for Invertebrate Pathology (SIP) was held on the Gold Coast of Australia. Prof. HU Zhihong from Wuhan Institute of Virology, Chinese Academy of Sciences has been elected as the President of SIP from 2018 to 2020. For the first time in 50 years, scientist outside the European and American countries has served as the president of the organization. SIP has a long history, which is a multidisciplinary international academic organization founded in 1967 by Professor E. A. Steinhaus from University of California. Now SIP sets up 7 divisions: Bacteria, DBI, Fungi, Microbial Control, Microsporidia, Nematodes and Virus, and has nearly 500 members from more than 50 countries. SIP aims to enhance the scientific research level of invertebrate pathology and related fields through academic discussions, publications of research papers and reports, improve the education and training of invertebrate pathology researchers, and promote international exchanges and cooperation. It plays an important role in promoting China’s research and development of invertebrate pathology, microbial control and research and application on biopesticide, as well as academic exchanges with foreign first-class laboratories. Professor HU Zhihong has been engaged in research of insect viruses for a long time, and has made important achievements in studies on the molecular mechanism of baculovirus infection, genetic improvement of viral biological pesticides, and synthesis of baculovirus. Professor HU previously served as the Council Member and Vice President of SIP. This election is not only an affirmation of her outstanding scientific achievements from the international academic community, but also a testament to the rising international influence of China in the field of invertebrate pathology and biological control.